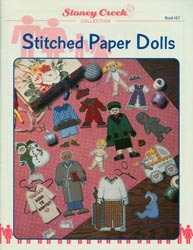 Seven different "paper dolls" that can be stitched with your choice of ethnic skin and hair tones. Each doll comes with 3 or 4 outfits to stitch. Granny Doll (50w x 108h Stitches): outfits include Dress Suit (58w x 65h Stitches), Dress Hat (22w x 13h Stitches), Dress Shoes (16w x 7h Stitches), Gardening Outfit (52w x 62h Stitches), Gardening Hat (45w x 21h Stitches), Gardening Shoes (17w x 12h Stitches), Nightgown that says "Born to Babysit" (50w x 67h Stitches), Curlers (26w x 15h Stitches) and Slippers (22w x 13h Stitches). Grandpa Doll (50w x 111h Stitches): outfits include Gardener overalls (57w x 93h Stitches), Golfer's Outfit with golf bag and club (61w x 95h Stitches), Pajamas (52w x 86h Stitches) and Slippers (18w x 7h Stitches). Although the No-Fray Aida is no longer available, these designs can be stitched on Aida then ironed on to interfacing before trimming as "paper dolls" or Needlework Finisher can be used.